An artist's illustration of the exoplanet Kepler-1625b with its hypothesized moon, which is thought to be about the size of Neptune. This candidate moon, and others like it, could host satellites of their own, researchers say. Extrasolar moons, or exomoons, are moons that orbit a planet outside our solar system, called an exoplanet. Although nearly 4,000 exoplanets have been discovered by space telescopes like NASA's Kepler and TESS since 2009, only one exomoon has been described — and it's still unclear if it's actually a moon. 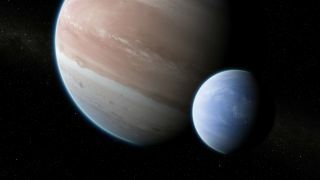 Astronomer David Kipping and his graduate student Alex Teachey at Columbia University in New York first reported the possible exomoon in October 2018 in the journal Science Advances. Using NASA's Hubble space telescope, the pair watched as Kepler-1625b — a Jupiter-size exoplanet — passed in front of its star, causing a slight dip in the amount of light visible from Earth. This "transit method" is how thousands of exoplanets have been discovered so far. But watching Kepler-1625b transit in front of its star came with two surprises. First, the exoplanet completed its transit about 1.25 hours earlier than expected, which suggested that something was gravitationally tugging on it. Then there was a shallow dip in light shortly after the planet finished passing in front of the star, possibly indicating a satellite trailing behind Kepler-1625b. "We've tried our best to rule out other possibilities such as spacecraft anomalies, other planets in the system or stellar activity, but we're unable to find any other single hypothesis which can explain all of the data we have," Kipping said during a teleconference with reporters. The alleged exomoon is the size of Neptune — around a third the size of Kepler-1625b. That's enormous for a satellite, which is usually much smaller than the planet it orbits. Such moons are predicted to be quite rare, if not impossible, by current models of planet-moon system formation. "We're not cracking open champagne bottles just yet," Teachey told Nature. But "things look exciting, tantalizing, maybe compelling." Exomoons in the search for life ? Reflected light — Light reflected or emitted as heat from an exomoon's nearby planet could provide long periods of stable temperatures that would encourage life to spawn. Radioactive elements — Radioactive elements, such as uranium and radon, that are found in rocks deep inside an Earth-size exomoon, slowly break down over time and release heat to the surface. Tidal forces— The gravity of a large exoplanet — say the size of Jupiter or Saturn — might pull on an exomoon to create tidal forces, similar to the way our moon pulls on the Earth’s oceans to create tides. When a rocky exomoon's surface is tugged by the exoplanet's gravity, it can generate heat that could travel to the surface. Around 175 moons exist in our solar system. Many of them have the above characteristics, and two of those moons have become strong contestants for harboring life as we know it: Jupiter's moon Europa, and Saturn's moon Enceladus. Both satellites have icy surfaces that are covered in stretch marks from the tidal forces of their parent planets and that never exceed minus 200 degrees Fahrenheit (minus 128 degrees Celsius). But a few miles beneath each of their surfaces sits an ocean that holds more water than found on Earth. And where there's water, there could be life. Where are the other exomoons? By some estimates, there should be 100 to 1,000 times more of these icy, ocean-bearing moons in the Milky Way than there are Earth-like planets, but they're hard to find. Kepler-1625b's sun-like star sits about 8,000 light-years from Earth. That distance makes the star only a tiny pinpoint of light, but advanced technology has allowed scientists to detect the minute silhouette created when a planet crosses in front of its star. And for Kepler-1625b's alleged giant moon, detection is easier because of its size. But for any potentially Europa-size exomoons, which would be only a quarter the size of Earth, the dip in light as it moves in front of a star may still be too small to decipher clearly with current technology.